With Raja Chulan Monorail Station at its door step, Crowne Plaza Mutiara occupies a prime spot in Kuala Lumpur’s Golden Triangle. It features 5-star fitness facilities and an award-winning spa. 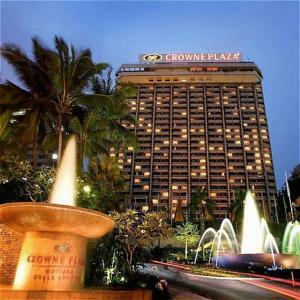 Crowne Plaza Mutiara Kuala Lumpur is conveniently situated a 10-minute walk from Petronas Twin Towers and Suria KLCC. It is about a one hour drive from Kuala Lumpur International Airport and provides free parking. Offering the comfort of modern furnishings, spacious rooms are equipped with a DVD player and ironing facilities. Luxurious open-concept bathrooms come with separate bathtub and rain shower facilities. Enjoy a soothing massage at Angsana Spa after active workouts at the tennis courts or well-equipped fitness center. The friendly staff can provide business and childcare services. Dining highlights include international buffets at Planters’ Inn or stylish Asian dining at ISHq. After-meal drinks are served at Glass Lounge and Club Bar. Rooms: Hotel Rooms: 560, Hotel Chain: Crowne Plaza Hotels & Resorts. Wi-Fi is available in the hotel rooms and costs MYR 49.60 per 24 hours. Free! All children under 19 years stay free of charge when using existing beds. One older child or adult is charged MYR 100 per person per night in an extra bed. The maximum number of extra beds in a room is 1. There is baby beds in a room is 0 capacity for cots in the room. Any type of extra bed or crib is upon request and needs to be confirmed by management. Supplements are not calculated automatically in the total costs and will have to be paid for separately when checking out.